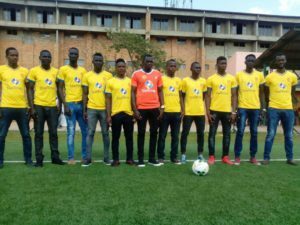 The new KCCA FC players in a group photo at the StarTimes stadium in Lugogo. Courtesy photo. FOOTBALL–With the departure of several key players that helped them win the league and cup double for the first time in their history last season KCCA FC had to make re-enforcements and that is exactly what they have done. Although the players that have signed for KCCA FC are not big names Mike Mutebi the man responsible for last season’s triumph is confident the new recruits will help his team win a third successive league title. This off season, league top scorer Geoffrey Sserunkuma, Ivan Ntege, Brian Majjwega and influential midfielder Tom Matsiko have all left the Kasasiro Boys for greener pastures. “The biggest problem with Ugandan footballers is that they loose the hunger after winning a few trophies and it also happened to some of our senior players,” Mutebi said. “The new players I have brought on board are very hungry for success and I am confident they will replicate it on the field every chance they get,” he added. Veteran striker Sserunkuma scored 21 league goals last season but turned down a new contract offer from KCCA this off season to join Zambian Premier League team Buildcon FC. With only up to four days to the new season, the two time Uganda Premier League champions have signed 11 new players from the top three tiers of Ugandan football.